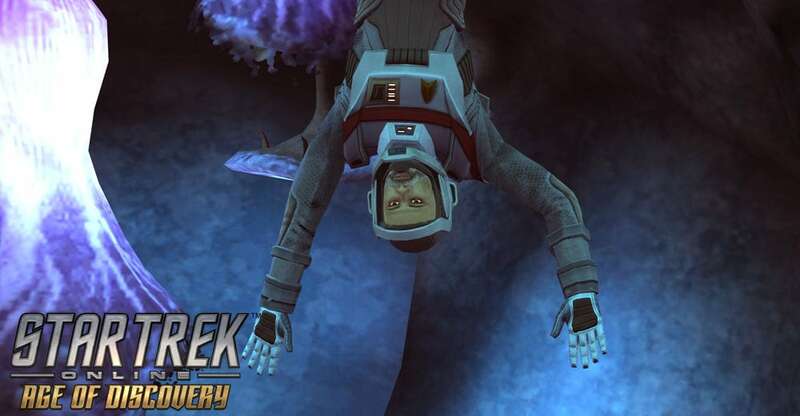 Hanging upside-down by a bundle of alien mycelium in a subterranean cavern was not Doctor Bashir’s choice of holiday, but he remained philosophical about the predicament. It would not do to panic, even though his EV suit computer showed that integrity had been compromised and some of the spores had somehow made their way into its atmospheric system. It would not do to panic at the thought of those alien spores winnowing into the air cyclers and thence to his lungs. It would not do at all to think about the effect that Elachi spores had upon various humanoids. Even though these were not Elachi, they were probably distant relatives of some sort, and their effect would likely be deleterious. It would not do, so he decided to retain a certain level of bemused detachment instead. “Bashir to Aventine,” he called through his comm system. “Things are becoming a bit more urgent here.” He hoped that his voice carried an undercurrent of amusement rather than concern. “First come, first rewarded,” replied Bashir. He craned his head up – down, relative to gravity – and his suit’s lamp shone into the deep pit below. The slight movement in the distance was just the mist. Certainly the mist. Couldn’t be a life-form – nothing here but fungi. He took a deep breath and did his best to resist the urge to try to untangle his legs from the mycelial webwork that ensnared them. “Of course,” said Kuumaarke. She moved to the edge of the pit, then started tugging at the fibers. “You could have just used your tricorder,” she said, a bit teasingly. Then the fiber snagged around Bashir’s leg snapped, and he fell. “What happened?” shouted Ezri over the comm, even as Kuumaarke let out a yelp and fell over backward. Bashir windmilled his arms ineffectually, letting out an indiscriminate yell, then his fall stopped suddenly as he splashed into a pool of muddy water some fifteen meters below. Bashir stood and waved off the young man’s excuse with an airy hand. “Don’t worry about it. I think I’ll be fine, aside from bringing some of this mud aboard.” He unlatched his helm and leaned forward, which caused a small fountain of muddy water to pour out over the lip of the breached suit’s collar. Kuumaarke likewise unlatched her own helm. The crewman stood by nervously, not sure whether he should leave his post, shifting from foot to foot. With a whoosh the transporter room door opened and Ezri entered in a rush. The crewman looked slightly ill as he stood straight up at attention, but the captain had no time for him; she immediately stepped up to the transporter pad and took Bashir’s arm. “You know doctors are the worst patients,” he said with a grin.